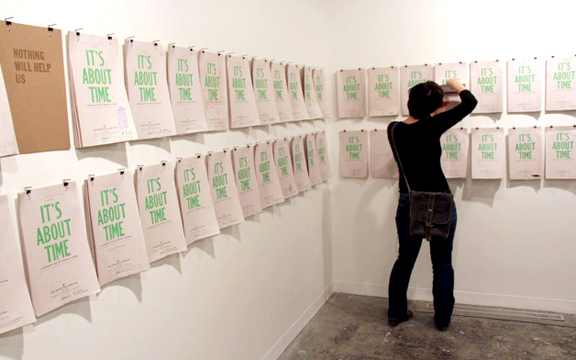 ILSSA members explore TIME in this interactive workbook project. “Time. What is it?” “How do you save it?” “How do you spend it?”“Can you make more of it?” ILSSA It’s About Time: A Workbook For The Working Person asks these questions and 24 more. In return, the questions are visually and verbally explored by 48 participating members of Impractical Labor in Service of the Speculative Arts (ILSSA), an organization for makers who use obsolete technology (OT) in conceptual or experimental ways. The completed workbooks comprise the exhibition. ILSSA is a socially engaged art project consisting of a Union and a Research Institute. Founded in 2008 by Bridget Elmer and Emily K. Larned, ILSSA is an ongoing and evolving publishing and social practice platform committed to investigating the value of labor. This workbook is the most recent in a series of projects that ask members to reflect upon their process, and to share this reflection with the public. ILSSA uses obsolete technology because the current economic crisis is a result in part of an over-extension of credit, a cultural obsession with the new, and a devaluation of means. It is time to reconsider how we live and why we live. Embracing what we already have and reapproaching it creatively is an essential part of this reconsideration. Sustainability, affordability, accessibility; controlling the means of production; opportunities for fresh solutions due to severe restrictions; labor-intensive processes which highlight the inverse relationship of meaningful work and remuneration; a prioritization of process over product: these are the values shared by many, if not all, forms of OT. In addition, ILSSA engages Marshall McLuhan’s notion that OT, once freed from serving its original purpose, becomes an artform. To learn more about ILSSA, visit www.impractical-labor.org.